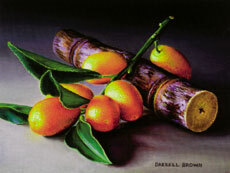 Darrell Brown, a teacher at NOAFA since 1984, is widely recognized for his skill with the use of color pencils and pastels to create detailed, photo-realist works. His art has often been influenced by myth and movies. His work is frequently exhibited in Southern galleries, and he was the winner of a competition for an Absolut Vodka billboard design in 1995. He also directs the NOAFA frame shop. Louisiana State University, Baton Rouge: BFA, 1970. San Francisco State University: MA, 1978.